Last month I wrote about an aeriel picture taken in 1929 of Port Maitland. My article, described some of the buildings that were on the eastside of the river in 1929 and what has happened to them. This month and depending on how long winded I am, maybe for the next two months I will tell you about buildings on the west side of Port Maitland that are no longer there. The west side of Port Maitland has not escaped without considerable change. The sandy beach running unobstructed by breaks walls can be found in front and well up river from the former Exchange Hotel, later known as the Maitland Arms Hotel. The sandy river beach continued to where today the steel break wall now ends in front of the former Moss Post Office. The old Exchange Hotel has long since been replaced with a cinder block building now housing the Port Maitland Apartments.Next month I will go into some detail about the Exchange Hotel. Starting at the foot of the pier the first structure we encounter is Milo Gillap’s snack bar/restaurant. Even Milo’s 1929 snack bar was a change from what was there only a few short years before. His former building had been destroyed by flood waters in 1928. The new one shown in this photo lasted only a few years, burning to the ground on Christmas Day 1933. It was not a very fancy snack bar by today’s standard, - a simple wooden structure with a peak roof and a covered porch facing out onto the river would be an adequate description. It was located approximately where the driveway is opposite of Joe and Betty Flatt’s bait and tackle shop. From other photos I have of both snack bars it is apparent that Milo engaged in a business of selling Silverwood Dairy ice cream, light lunches, soft drinks and films for his tourist customers. Both snack bars were welcoming places with benches placed around and about the exterior of the buildings. In 1929, there was no break wall, meaning you could step onto the sandy beach from the wooden sidewalks placed there for your comfort and conveyance and then into the warm water of the Grand River. The Victoria Hotel was situated opposite Milo Gillap’s and where Joe and Betty Flatt now have their bait and tackle shop. The Victoria sat majestically overlooking the mouth of the river and the sandy shores of Lake Erie. Built in 1904 by George Martin a brother of Ed Martin the owner of the Exchange Hotel, it was described at the time of its opening as “a building fifty by seventy feet in size, three stories high, and had twenty bedrooms, two sitting rooms, a dining room eighteen by twenty, and a large kitchen. It was lighted by forty windows and had thirty-two doors.” The Victoria Hotel was a place where many social events were held by tourists and locals alike. 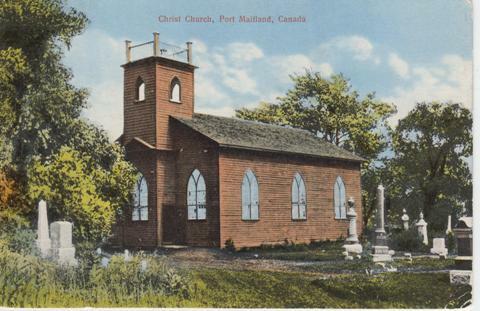 In September 1928, the ladies of Christ Church Port Maitland gave a dance at the Victoria on behalf of the building fund. 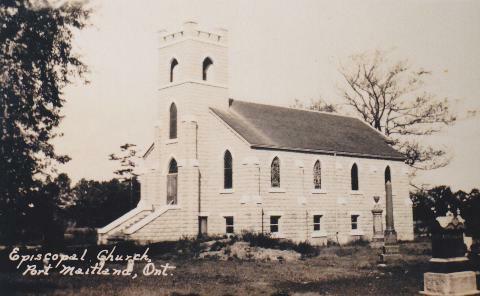 (Their old wooden church had been destroyed by fire in 1926.) $1.00 was charged per couple or 50¢ extra per lady. It was noted that Culp’s Orchestra provided the music. The Victoria never had a liquor or beer licence. That was not problem however as liquor and beer were not far away. If the young men and women of Port wanted to refresh their pallets they only had to visit Fred Vorwerk next door where he ran his bootlegging establishment. Joe Flatt remembers he owned Fred’s old home for about five years when Stan Franklin asked him if he knew about the room where the booze was kept. He didn’t and once Stan told him where it was he could not get home fast enough to run upstairs and find the hidden trap door. There he found a room approximately twenty by ten feet, not quite high enough to stand up in but big enough to hide the booze from the prying eyes of the law. Joe and Betty raised their four children in this great old home. Many of you will recall your visit to Joe and Betty’s snack bar for great french fries, fish and chips, hot dogs, hamburgers, milk shakes and to listen to the juke box on those hot summer evenings. The house is gone now and has been replaced with a smaller new home more suitable for Joe and Betty with their family now grown up and almost all married off! But alas, back to the Victoria Hotel. On January 10, 1944 the Dunnville Fire Department responded to a fire at the Victoria Hotel at Port Maitland. The note found in the records simply states. “Hotel burnt to the ground, used pump of the truck and twelve lengths of hose. Was out of town four hours.” Viola Franklin told me that she recalls the night the Victoria burnt down. There was considerable suspicion that it was torched by some young fellow that arrived the night of the fire then never seen at Port again. The investigation took the police to Niagara Fall NY, but the suspected arson was never resolved. Viola tells me that it was the airport fire department from the flying school that was able to reach Port Maitland first and successfully save the Vrowerk home. Millo Gillaps Resturant destroyed by storm of 1928. A Tom Sawyer style photo of Port Maitland. Taken near current Port Maitland Apartments looking north east.